Our sheep are raised on pasture and are 100% grassfed. All of the lambs are born on pasture in June. 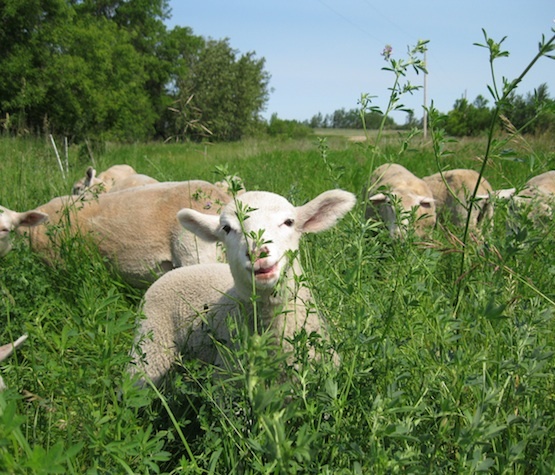 The lambs are raised on mixed perennial pastures and finished on a mix of perennial and annual grasses and alfalfa hay at 7-12 months of age. We feed grass/alfalfa hay through the winter. Our lambs do not receive any additional feed supplements. We use high density planned grazing, moving the sheep every few days, with the objective of raising strong healthy lambs while contributing to healthy soils and healthy pastures. Check out http://www.eatwild.com for great information on the health and environmental benefits of grassfed!